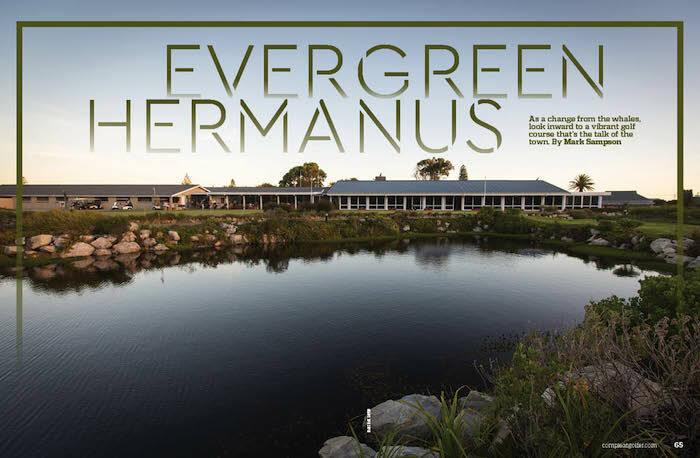 As a change from the whales, look inward to Hermanus GC, a vibrant golf course that’s the talk of the town, writes MARK SAMPSON in Compleat Golfer. The water crisis in the Western Cape has influenced all spheres of life, from households to farming, building, tourism and hospitality. Golf courses across the region have had to make do with low water allowances and the condition at some has deteriorated to a point where golfers are looking for options elsewhere. One course, that has been largely unheralded, is emerging as an ideal venue. Just over 100km out of Cape Town the small town of Hermanus, better known as a tourist destination for whale watching, is now becoming a favourite getaway. And why not? It is a short drive, it seems to have avoided the water crisis (to a degree) and is the ideal family destination. The town, or village as locals call it, has much more on offer than just whale watching, with secluded beaches, a variety of restaurants, local vineyards, mountain biking and, for the more adventurous, shark-cage diving. As a destination, golf has never really been seen as a selling point. Until now, that is. It was only in 1907 that 10 villagers decided that the village needed a course. Members were required to pay the princely sum of five shillings to set the construction in motion. As finances became tight, the municipality, which owns the land, bought into the project. But that created its own problems, as in 1973 holes 16 and 17 were targeted to become part of a new township. The town council subsequently aborted the plans for the housing area, but the incident reignited members’ concerns that the lease on the land could be cancelled or changed at any time. In 1999 plans were drawn up for the construction of a secure estate of 600 houses and the addition of a new nine holes. But everything hinged on the never-ending negotiations of the lease on the land. Finally, in May 2007, in its century year, the land was bought by the club to secure its future. Immediately, Peter Matkovich and Dale Hayes were brought in to design nine new holes and improve six on the old course. Now, boasting near-pristine conditions all year round, the course is being elevated to even greater heights. Nestling at the back of the town, at the base of the Olifantsberg, it meanders through mature pines with views of the ocean opening up every now and then. The 27-hole configuration allows for three variations of 18 holes, with the East course, holes 1-18, being the preferred tournament layout. From the club tees the course is a mere 5 757m, although it can be extended to 6 086m from the championship tees. Taking into account a number of tight tree-lined fairways, subtle bunkering and the all-too-common coastal wind, it can be a formidable challenge. The greens, although not quick, are generally large, although some have severe slopes. Staying on the right side of the flag is a must. It’s tough to identify standout holes as so many are unique and picturesque. is paramount. Keeping the ball right, on the top level, will make for an easier approach to the elevated green. Leaving the ball short is not an option as the green has a steep drop-off short and a large bunker right. Before teeing off, enjoy the views of the surrounding mountains. Although downhill, the 370m par-four 7th is well deserving of the stroke one rating. From the tee, the fairway bunkers on the right need to be avoided. The approach is with a long-iron and needs pinpoint accuracy as the green drops off to the left and a large bunker awaits on the right. If the flag is at the back of the green, avoid the aggressive play as that area also drops off. A par here is worth a pat on the back. The signature hole on the course is the 11th, a short par five riddled with danger. 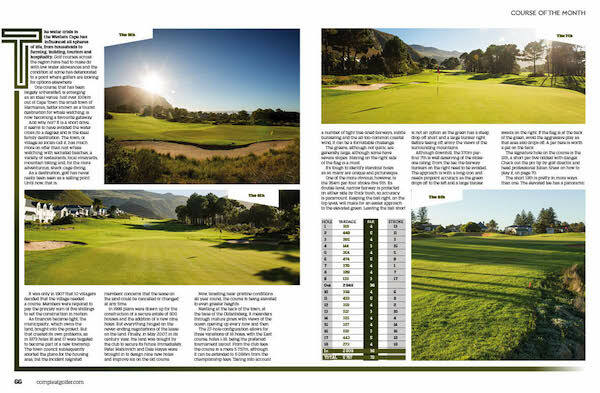 Check out the pro tip by golf director and head professional Julian Shaw on how to play it, on page 70. The short 13th is pretty in more ways than one. The elevated tee has a panoramic view of the village and the distant ocean. It’s well worth a break to take it all in. The hole is 152m long, but plays closer to 140 with the drop in elevation. The putting surface is protected by a large water hazard to the right and a deep bunker front left. The green slopes down from back to front, so keeping the ball below the hole will avoid leaving a downhill slider. Remember to keep the wind in mind. The closing hole on the East course is a par four of only 273m. It’s a sneaky risk-and-reward hole, with the longer hitters having a good opportunity for birdie. The green is, however, well protected with a dam right and a collection of bunkers left and back. The green is small and makes for an elusive target even with a short-iron. Holes 19-27 are similar to the first 18, meandering through the trees towards the mountain and looping back. Any combination of the three nines makes for an enjoyable round, although accuracy is always required. Having hosted more than 61 000 rounds of golf in 2017, the club is on a strong trajectory. The management team have got their finger on the pulse of the golfing market, catering not only for their club members but also the influx of tourists coming into the area for the season, so every day is a buzz of activity. 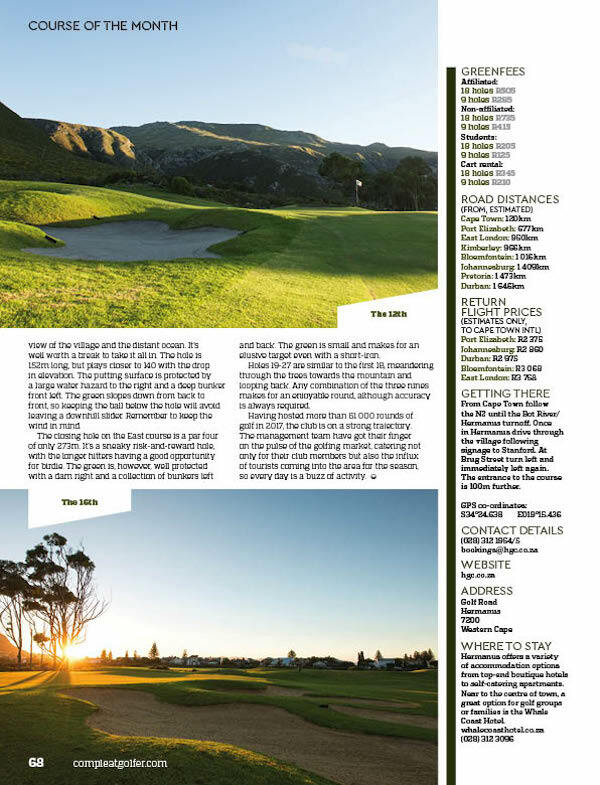 – This article first appeared in Compleat Golfer’s April issue, now on sale!